Paintball is a fast paced sport that is enjoyed by people of all ages (minimum ages vary from state to state) and fitness levels. The equipment you receive for your action-packed paintball adventure is important to your complete safety and enjoyment. With paintballs reaching speeds of up to 300 feet per second, we recommend you check with your paintball provider to ensure that you will receive a full-length body suit at a minimum. At the AUPBA we are always looking to improve paintballing standards throughout the country and to find exemplary paintball centres to display these impeccable standards. When it comes to paintball equipment, Delta Force paintball centres throughout the country offer the complete service. All players receive the latest semi-automatic paintball machine gun, full head protection goggles, full-length camouflage overalls complete with a padded neck collar and a 400-shot capacity battle pack. However the most impressive piece of equipment that all Delta Force players receive is the custom-designed body armour to protect the upper torso. This state-of-the-art paintball vest will reduce the impact of paintballs on your body and will make your day of paintball even more comfortable. These vests are also extremely popular with female paintball players and have opened the sport of paintball to a much wider audience. 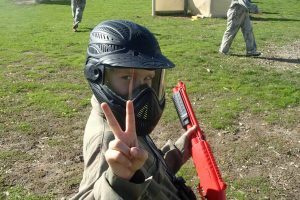 Delta Force paintball centres place an emphasis on safety, and their impressive equipment is just one of the reasons they have received an AUPBA 5-star rating. For more information on protective paintball gear have a look at the equipment page on our partner site Melbourne Paintballing. 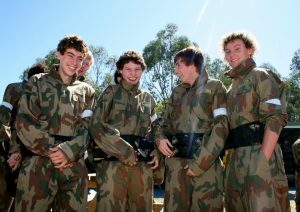 For a complete list of AUPBA approved paintball centres, click here.